It was recently brought to my attention that there may be a problem with one of my recipes. After a little troubleshooting, we figured there was some confusion about the type of noodles to use. When there is a special ingredient in a recipe, I normally try to take a picture or post a link so people are somewhat familiar with the item if they want to go purchase it. If there’s any question about an ingredient or substitution or if you have a suggestion, please don’t hesitate to contact me by leaving a comment or emailing me at blazinghotwok(at)gmail(dot)com. I want people to enjoy discovering a new recipe and not get discouraged or frustrated because something didn’t work out! Okay, sometimes us food bloggers take stuff for granted and assume people know what we are talking about. Or sometimes we aren't good at clarifying, which appears to be the case with the rice noodles. So, it seems only appropriate I explain a little about the rice noodles I use. If you are familiar with the different types, I won't blame you for not reading on. However, maybe you could do me a favor and check out the recipe in question and let me know if it's easier to follow. I put in new tips. I typically use one of three kinds, which can make it a bit confusing. Sometimes they can be interchanged, however, one may be more appropriate than the others for a particular type of recipe. As an example, think about spaghetti alla carbonara. You can substitute fettuccini or linguine, but it wouldn’t work very well with rigatoni, would it? When substitutions can be made, I will indicate it. 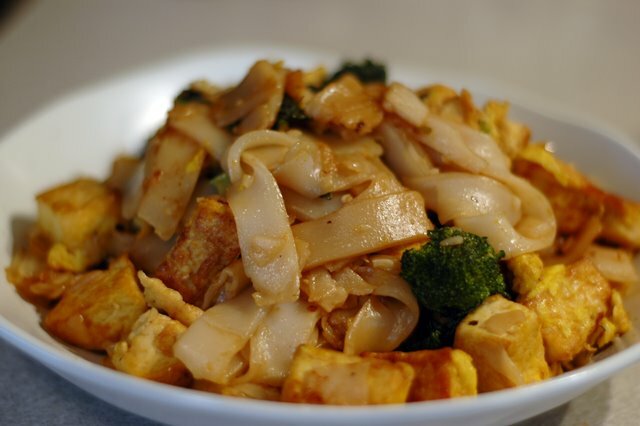 For some recipes the best rice noodles to use are the fresh ones, also known here in the States as chow fun noodles. I like to use these noodles for pad se ew, pad kee mao, and chow fun. These noodles are sold in sheets so you can cut them into any width you like. Sometimes they are pre-cut into strips. Both types have been oiled to keep the layers from sticking, although I wonder if that really helps. They can be kind of hard to separate when cold and it’s a little easier if they are at room temperature. Fresh means they are found in the refrigerated section. There is another type of semi-fresh rice noodle that I like to use for dishes like pad Thai. 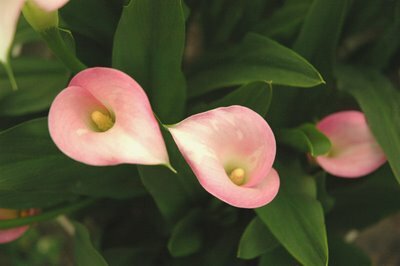 They are pliable, but not soft. Unlike the fun noodles, they are not oiled and come vacuum packed. They technically don’t require pre-soaking, but they can be hard to separate when hey are cold. I like to put the noodles in lukewarm water while I separate the strands. If you don’t loosen the strands well, they will stay clumped up when you stir-fry them. Make sure to drain them well before using. Lastly, there are the rice sticks. 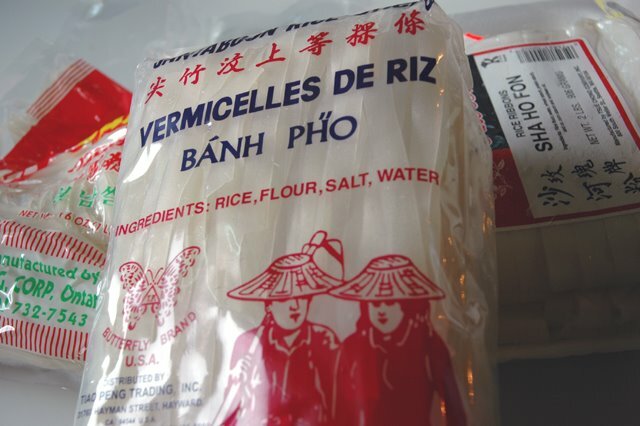 These are the dried rice noodles commonly used for noodle soups. They are also great to use for pad Thai if you don’t have access to the semi-fresh noodles. If you plan to use them for anything other than soup, they must be soaked. For soup, I simply boil them. The soaking time depends on the brand, the temperature of the water and the age of the noodles. You’ll want to soak them so they are semi-soft, but not completely soft, otherwise they will turn to mush when you stir-fry them. Be aware that dry weight is not the same as hydrated weight. Just to test the difference between the two, I softened 9 oz of dry noodles by pouring boiling water over them for 8 minutes, rinsing with cold water, then draining well. Even before weighing them again, I could see they had expanded a lot, and sure enough, the hydrated weight was just over a pound and a half!! Before I post a recipe, I generally try it out a couple of times to make sure the results are consistent or to work out the issues from the first attempt(s). Still, mistakes can happen so I wanted to revisit the recipe in question: pad se ew. It’s basically stir-fried rice noodles with egg and soy sauces. Nothing fancy, but quite delicious, especially when dressed up with various condiments. As I said in the original post, this is a fairly versatile dish because you can add whatever vegetables and protein you’d like. For this dish, I always use fresh rice noodles because that was the type of noodle mom always used. However, I wanted to try using the rice sticks because everyone has access to these and I wanted to compare the results. The top picture is the redo and the bottom picture is the original I did in January. The noticeable differences were color and texture of the noodles. The fresh noodles have a “chewier” texture and are a little thicker and oilier. I definitely prefer the fresh noodles, but using the dry noodles worked out fine. I want to note that the lighter noodles were by no means bland, but I don't think they fried up as well due to less oil. But if you're worried about fat content, using rice sticks is probably the way to go. There was some concern the sauce proportions were not sufficient for the 1 ½ pounds of noodles, but actually they were okay. I always make a double portion of sauce because heaven forbid there's not enough sauce and I'm running around trying to get ingredients together while the food is cooking. A double portion makes about 7 tbs and for this amount of noodles, I used 4. If you have extra sauce left over, spike it with some chili garlic sauce or sambal and serve as a condiment in case people want to spice up the dish a bit. Now that you've read this far, I should just tell you I updated the original recipe with notes just so everything is clarified. Enjoy! And I thought the potato was hard to deal with, but in a way, the tomato is even harder! 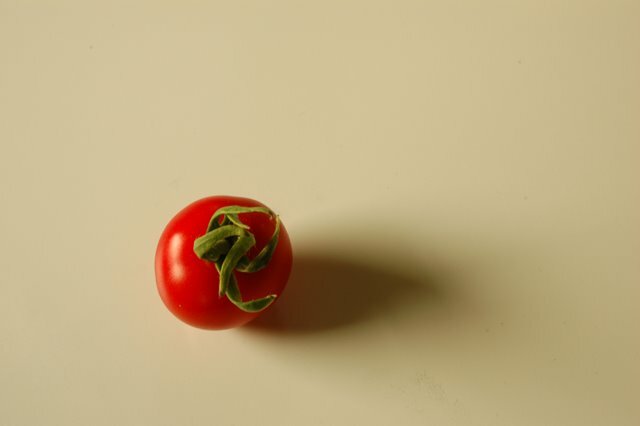 As of this post, this lone tomato is the only one I've been able to harvest from my garden. Soon enough, I'll be rolling in tomatoes. Oh, I could think of a million things to do with it, but most of them don’t involve cooking, at least not this time of year. Right now, the most appealing thing I can think of is to pick a sweet little sungold off the vine and pop it in my mouth. However, that wouldn’t make a very interesting post and since I’m hosting Weekend Wokking this month, I thought it’d look better if I actually made something. As luck would have it, I found a recipe in my Food of Thailand book (see right side bar) that looked interesting and for which I had all the ingredients. I love when that happens. I’m no history expert, but I’m pretty sure the tomato is not native to Thailand and is not widely used in Thai cooking. 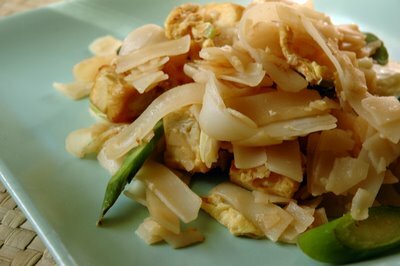 However, it makes an appearance in a few dishes, such as som tom, hot and sour soup, and Thai-style sweet and sour pork. It seems to be more widely used in Thai restaurants here in the States, where I’ve seen it served in fried rice and even pad kee mao. I’m not a purist, so I don’t mind at all. The one thing to consider about stir-frying tomatoes is the ripeness of the tomato. I prefer to use harder tomatoes. In fact, those picked-before-their-peak, store-bought tomatoes usually work well because they have firm flesh. They will soften without dissolving, if you know what I mean. Using riper tomatoes will give the stir-fry a little more of a tomato-y sauce. It’s all a matter of preference, really. I should also talk a little about the other ingredients in this dish because they are special as well. The first is Thai eggplant. Most of you have probably encountered these before. For those who haven’t, it’s a small round fruit (vegetable??) with an eggplant flavor. Usually the green and white ones are available, but there are some that are completely white and even some purple ones. These varieties have a lot of little seeds, but they are completely edible. I think they give a pleasant crunch to the dish, kind of like fish eggs on the outside of a sushi roll. Unlike it’s bigger, more familiar relative the purple eggplant, it is less spongy. Some people may find that steaming Thai eggplants for 5 to 10 minutes (depending on size) gives a nice soft texture. Usually I’m too impatient to do this. I just cut them into quarters and add them to the food, allowing an additional 5 to 10 minutes to cook. If you can’t find Thai eggplants, you could certainly use the more familiar purple kind or the Chinese purple eggplants. The only difference to the dish would be the texture. The other ingredient is Chinese black vinegar. Often I see recipes say that balsamic vinegar can be used as a substitution. I would be hesitant to use balsamic though. The Chinese vinegar is a lot sweeter and much less acidic than balsamic. It’s also made of rice and not grapes. I suppose in a pinch you could use balsamic, but use less to account for the acidity. Now for the dish…it’s tasty! I’m not saying that to be snobby. I was actually quite surprised. It was the first time I’d made it, and I was a little nervous scanning over the list of ingredients. I mean, two tablespoons each of palm sugar and Chinese black vinegar??!! I figured it would be way too sweet, but it turned out wonderfully balanced, both in flavor and texture. The flavor of the ginger comes through nicely too. For this particular dish I used firm cherry tomatoes, which I left whole. They held up to the stir-frying quite well, not tearing and releasing their juices. The result was an explosion of sweet tomato flavor with each bite. Just be sure to let the stir-fry cool slightly otherwise you’ll get a very hot explosion of flavor! If you want a saucier stir-fry, try cutting up the tomatoes. BTW, the chicken is totally optional in this dish. I added simply because I had some to use. I normally don’t pre-cook my Thai eggplants, but I did this time, so I recommend you doing it. Toss the eggplant halves with a couple splashes of fish sauce and steam them for 5 minutes or so, until they soften a bit. You don’t want them to be mush. When done, remove them to the side until needed. While the eggplant is steaming, make the sauce by combining the fish sauce, vinegar and sugar in a small bowl. Stir to dissolve the sugar. In another small bowl, combine the sambal, ginger, shallot and garlic. These will go in the wok at the same time, so it’s just as easy to put them together ahead of time. Heat your wok over high heat until very hot. Add about 2 tbs oil and when that begins to smoke, add the chicken. Stir-fry it for about a minute or two, just until it’s almost done. Remove to a bowl. Throw in the eggplants and tomatoes. Combine with the sambal mix, but don’t over stir or you’ll break the tomatoes. Once the vegetables appear to soften slightly (about 2 minutes), add the chicken back in. Toss a little, then add the sauce mix by drizzling it down the sides of your wok. It should caramelize fairly quickly due to the sugar content. Coat the chicken and vegetables with the sauce and once the chicken is cooked through, you’re done! Remove to a plate, immediately, but allow it to cool for about 5 minutes before digging in. If you’re interested in participating in Weekend Wokking, there’s still time! Send me your entries before midnight on the last day of the month. If you can’t make this round, check out whose hosting in the future. And check out Wandering Chopsticks; she’s the one that started it all. Added: Check out the round-up! A couple of times when I was a teenager, mom shipped us to Thailand to spend summer break with the relatives and learn about our roots. The first time I was 13 and it was so exciting to travel alone. Except I had my 8 year old brother in tow, and that was annoying. Since we stayed for 2 to 3 months at a time, we weren’t treated like tourists (that is, our relatives didn’t take time from work to show us around) and we were too young to venture out ourselves. The aunts and uncles worked during the day, so us kids mostly just hung out in the neighborhood. And because the adults had to leave 2 hours early to account for the horrendous Bangkok traffic, the cousins, brother and I had to procure our own breakfast, lunch and snacks. Every meal we ate came from one street vendor or another. No matter what else we’d eat during the day, we always made a trip to a particular vendor to get skewered, grilled fish balls brushed with a delicious sweet chili-garlic sauce. We’d wait patiently while the old man turned the perfectly round, skewered balls over a hibachi-type grill. I just could not get enough of these snacks. Even though I haven’t had them in years, I still remember how delicious they were. I’ve tried to replicate that delicious street snack, minus the street, oppressive humidity and pesky baby brother. Maybe that’s why the version I made could never compare to the ones I ate every single day that summer long ago, but they turned out pretty good, if I do say so myself. 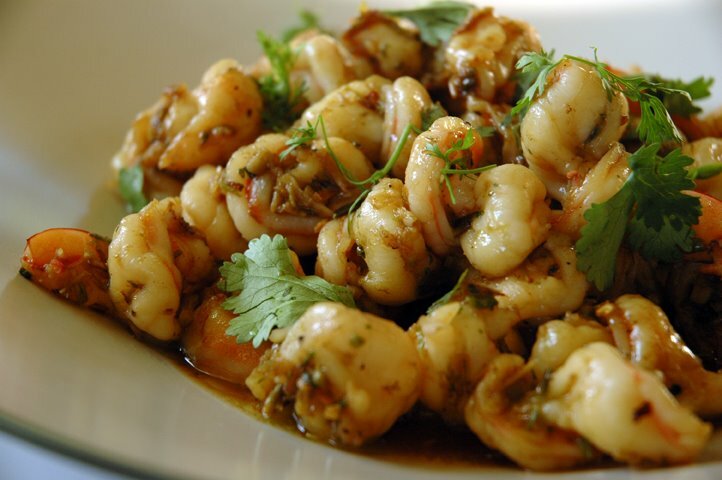 In a food processor, add the shrimp, egg, garlic, lime leaves and fish sauce and process just until you get a paste. Add the cornstarch and process just until incorporated. To make the shrimp balls, transfer the paste to a large bowl. It will be very sticky, so you’ll want another bowl of water next to you to wet your hands every so often. I made balls about the size of one tablespoon, but you are welcome to make them a little larger. As you’ll notice, they are hard to form in perfect balls. That’s okay; it’s rustic! For two pound of shrimp, you could get about 35 to 40 balls depending on how big you make them. Not the prettiest picture, I know. I wanted to show what the paste should look like, just so no one freaks out when they see how sticky it is. 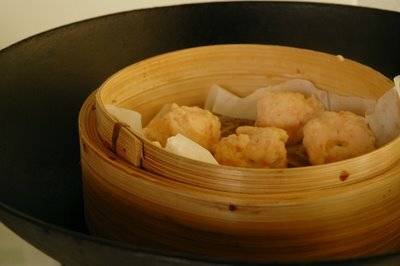 To steam the shrimp balls, I use my wok fitted with a bamboo steamer. Use whatever set up you want. Just be sure to line the bottom of the steaming basket with parchment to keep the paste from sticking to the basket. Once the water boils, they will take about 3 or 4 minutes to steam. You’ll have to steam in batches, unless you have an industrial sized steamer. Don’t crowd the balls; they puff up during steaming. They will deflate once they cool off. I like to remove the balls to a rack to cool. After the shrimp balls are steamed, you have a few options. 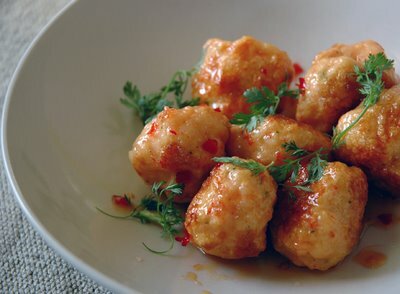 They can be served as they are, warm with the chili garlic sauce for dipping. This is the way to go if you are impatient or a health nut. If you are in the mood, you could skewer and grill them. If they are still warm or room temp, they won’t take very long at all. Brush a little sauce on them occasionally. Watch them though! The sauce can burn quite quickly due to the sugar content. Since I can’t be bothered to start up my Weber just for a few shrimp ball skewers, my second favorite way to enjoy them is sautéed in my wok, tossed in a little of the sauce. The sauce caramelizes nicely giving a deliciously ooey-gooey coating. Stick them with toothpicks or short skewers, and serve with some of the sauce for dipping. Your family and guests will love you. 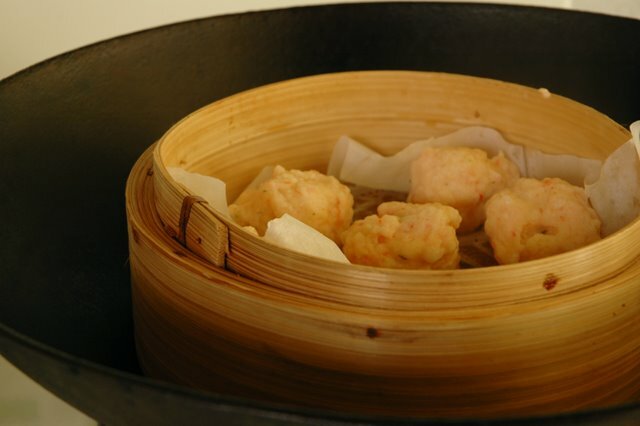 If you don’t have a crowd of people to feed, the shrimp balls can be frozen after they are steamed. Freeze them in a single layer on a cookie sheet. Once they are frozen, throw them into a Ziploc bag, pressing out all the air. If you've got a food vacuum sealer, even better! Thaw the balls in the fridge overnight before heating. This sweet chili sauce is so simple to make, you’ll never need to buy the commercial stuff again! It's just simple syrup spiked with a little vinegar (or lime juice or tamarind puree if you like), chili and garlic. Heck, you could put minced up ginger, green onions, diced white onions, diced cucumbers or even kaffir lime leaves in it too! If you find this sauce is too sweet for your taste, just add a little more vinegar and/or fish sauce. Also, I cheat and use the Lee Kum Kee (LKK) chili garlic sauce. Despite its fiery appearance, the LKK sauce is not very spicy. Even Sonny can eat it when I use it in foods. If you want to do it the “authentic” way, add about 2 or 3 minced garlic cloves and as much red chili flakes or sambal oelek as you can stand. And don’t worry if the sauces is not as thick as the commercial stuff; it’ll still taste great. In a small sauce pan, add the sugar, water and rice vinegar. Bring to a boil and continue to boil until it thickens a little, about 5 minutes after it comes to a boil. Take it off the heat and allow it to cool slightly. Throw in the garlic, chili and fish sauce. Stir and taste. Allow to cool to room temperature before serving. It will thicken a little more when cooled, although it will never be as thick as the commercial stuff. If this recipe has piqued your interest, you may also like Thai fish cakes. 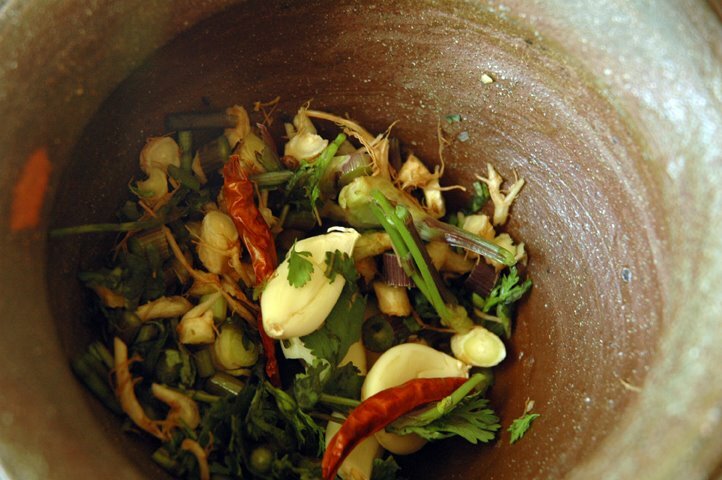 When most people think of Thai flavors, the first thing that comes to mind is probably fish sauce. Or maybe lemongrass, kaffir lime leaves and galangal. Rarely do people think cilantro roots. 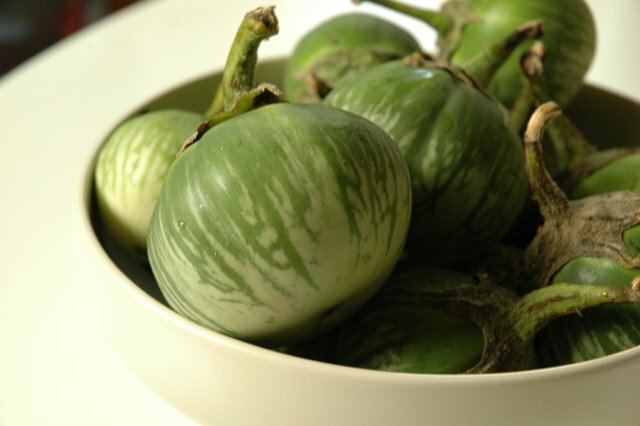 They're under-recognized by many, probably because they are rarely ever listed as an ingredient on menus in Thai restaurants. Funny because they're used in just about every Thai curry paste as well as in stir-fries and soups. The best cilantro roots to use for a stir-fry are the thinner ones. They break down easiest. 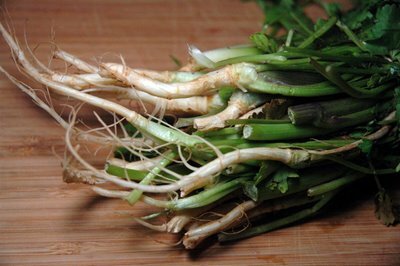 The fatter roots are good for soups, where they can be used mostly whole and easily fished out (like lemongrass). I can't accurately describe the taste of cilantro roots. They're not as peppery as a parsnip or turnip. They've got a bit of the cilantro taste, but not the same level of freshness you'd get from the leaves or even stem. Maybe they taste a little like celeriac, but not quite. For sure the flavor they contribute is subtle- most people would be hard-pressed to identify it- but they add an extra level of complexity to the end result. The only way to appreciate the flavor is to use them! Start by making the sauce. Combine the oyster sauce, soy sauce, sugar and 1 tbs water. Stir well to dissolve the sugar. Set aside until needed. There are two ways to go about preparing the flavor base. 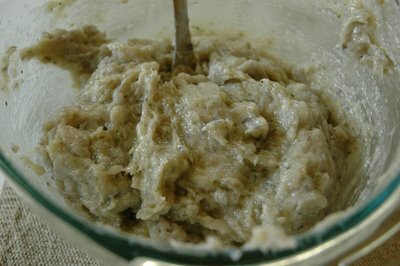 My favorite is to make a paste, but this will require a little more elbow grease and patience (but it's not as bad as making curry paste). If you go this route, you must slice the cilantro roots as finely as possible. They are quite fibrous and if not sliced in advance, will take forever to pound down. Pound/grind the sliced cilantro roots, garlic, peppercorns and chillies in a mortar until you get a smooth paste. Alternatively, you could make a rough paste if you aren't inclined to do all that pounding. The one advantage of a rough paste is being able to pick out the fibrous roots when you're eating. Start by splitting the roots in half lengthwise. Pound them in a mortar just to crush the fibers. Remove them from the mortar and add the peppercorns, garlic and chillies and pound them to a paste. Mix the garlic paste with the crushed roots. Gather all your ingredients so that they are close by, because this stir-fry goes pretty quick. Heat your wok over high heat until very (very) hot. Add about 2 to 3 tbs oil and when it's hot, add the flavor paste. Stir-fry for about 20 to 30 seconds, making sure not to let it burn. You'll start to smell the garlic and cilantro roots. Add the shrimp. Stir them around frequently (not constantly) until they are almost done. Add the soy sauce mixture, drizzling down the hottest side of your wok to get the sauce to caramelize a little. Toss the shrimp around to coat with the sauce. Taste and adjust flavor as needed with more soy (or water if it's too salty for you). Remove immediately from the wok and garnish with cilantro leaves. Serve immediately with steamed jasmine rice. I'm submitting this recipe to Weekend Herb Blogging created by Kalyn from Kalyn's Kitchen. The host this week is Simona from Briciole. If you can't participate this time around but want to, click here to see who's hosting in the future. I hope everyone had a safe 4th! We hosted a potluck BBQ with lots of food, drink and screaming kids. Sweet chaos. I wanted to thank everyone for the wonderful food and company. 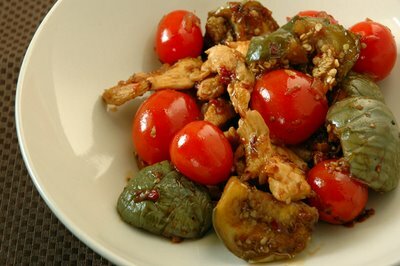 For those of you who want the recipe for the Thai BBQ chicken, here it is. Enjoy! Our holiday was generally safe, except for the bit where our neighbor almost killed us with her fireworks. It was one of those do-dads that had five bundled into one. The first one went straight up like it was supposed to, but with such force it flipped the bundle over. The next shot fired at the neighbor’s house across the street. No one was in the line of fire and those neighbors weren’t home. It was funny until we realized that the bundle had flipped again and was pointing directly at us. All I remember was parents grabbing kids and ducking for cover. It lasted all of 9 seconds but seemed like a minute. Funny now, but definitely NOT funny at the time. Also, I wanted to point everyone to the Weekend Wokking round-up featuring potato recipes from all over the world. I’ll be hosting the next round-up and the theme ingredient this time is the tomato! Send your entries to me by midnight on the last day of the month. And if you want to host a future round-up email Wandering Chopsticks at wanderingchopsticks(at)gmail(dot)com. Sonny lost 2 teeth on the same day this last week. Doesn't it look like someone punched him in the mouth? 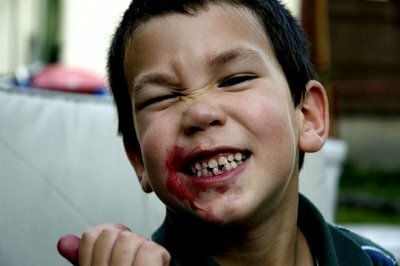 He was eating cherries. If you have kids, you may think this is a cute, funny picture. If you don't, you're probably grossed out. 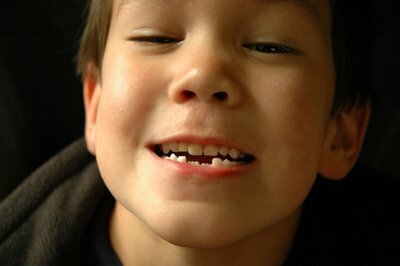 Shortly after this picture was taken he lost the second tooth. Notice how the teeth coming in are larger than the spaces they need to occupy? I think I see braces in his future. My lilies started blooming this week too. Aren't they pretty?